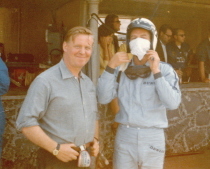 Tony started as Alf Francis's assistant in 1952, then ran a 250F for Stirling and later for Bruce Halford, driving all over Europe in Bruce Halford's converted Royal Blue AEC coach. In 1958 he joined the British Racing Partnership, created by Stirling Moss's manager Ken Gregory and Stirling's father Alfred, as chief mechanic, running the likes of Moss, Bristow, Brooks and Schell in BRMs and Coopers. In 1961, the team got sponsorship from UDT-Laystall and fielded a multi-discipline team of Lotus cars in F1 (18/21s), sports cars (19s) and GTs (Elite). They ran drivers like Cliff Allison, Henry Taylor and Moss and during the year developed the 18/21 as an alternative to the works 21s. In 1962 they ran Lotus 24s in Formula 1 and continued with the 19s in sports cars. In 1963 and 64 they developed their own BRP monocoque F1 car, although continuing to run their 24s and 19s as well, with Trevor Taylor and Innes Ireland being their regular Grand Prix drivers. Tony also designed the BRP Indy car, which ran well in the 1965 500 and also competed in the 66 and 67 races. After the demise of BRP in spring 1965 (due to its failure to gain admission to the newly created Formula 1 Constructors' Association), Tony moved to Cooper, co-designing the Cooper-Maserati Formula 1s that were driven by Jochen Rindt (among others) in the 1966 and 67 seasons. After spells working in the ice cream business, running a drinking club and owning a garage, Tony went into property. Now 81, he is retired but still retains a passion for the sport, including following modern-day Formula 1 racing.